> Hennessey Venom F5 to beat Chiron in top speed? 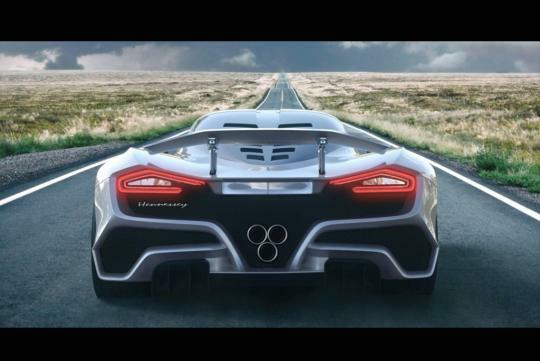 Hennessey Venom F5 to beat Chiron in top speed? Hennessey Performance is set to show its latest successor to the Venom GT at this year's SEMA Show. The car is set to be faster than Bugatti's Chiron in top speed. Obviously, huge power figures are a must and the company has fitted its new car, dubbed Venom F5, with a twin-turbo V8 that delivers more output than the Chiron’s 1,500 PS 8.0 litre quad-turbo W16 engine. The engine will be paired a single-clutch automatic with a six-speed manual being an option. Chassis-wise, the new car will feature a carbon-fibre tub and is set to be nearly 500kg lighter. Fitted with an aggressive aerodynamic package, the car is believed to be able to hit more than 465km/h.